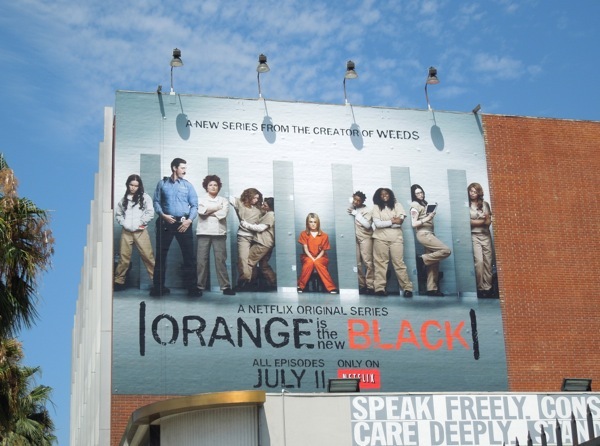 Black is so last season and orange prison jumpsuits are the fashionable new colour this Summer on Netflix in their new comedy-drama, Orange Is the New Black. Following high profile debuts like the U.S. remake of political drama House of Cards, fantasy horror Hemlock Grove and resurrecting sitcom Arrested Development for a fourth season, Netflix obviously has confidence in this new original series as they have already commissioned a second season even before the first season premieres. Let's face it though, when you release a full 13-episode season in one go and people like it, you don't want to leave those eager beavers waiting for too long before delivering more installments for fear of losing momentum. Based on the popular 2010 memoir of the same name by Piper Kerman, the show follows Taylor Schilling's preppy 'Piper Chapman' who is imprisoned when her wild past catches up with her. She has to trade her comfortable New York lifestyle for a 15-month stint in a minimum-security federal penitentiary and adapt to her new circumstances and fellow inmates, often to horrible and hilarious results. 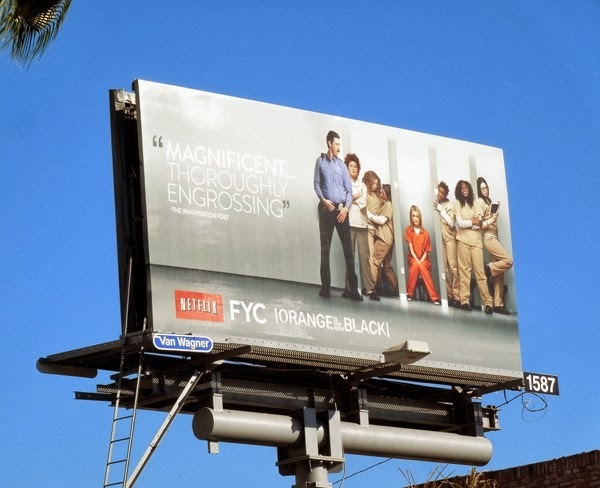 This funny creative for Orange Is the New Black cleverly hints at all the varied relationships and character dynamics of prison life. 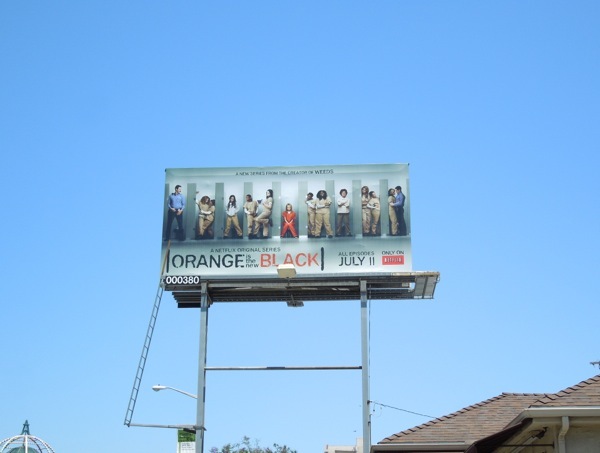 The larger series premiere billboard was snapped along Sunset Boulevard and the smaller version spotted along Fairfax Avenue on July 7, 2013. 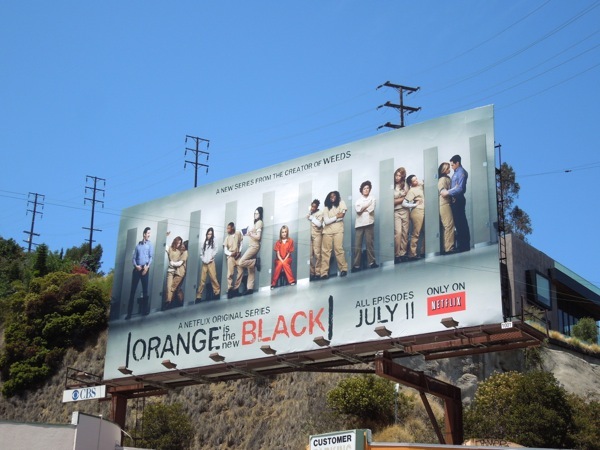 If you like these ads, be sure to also take a look at these other Netflix original series billboards. 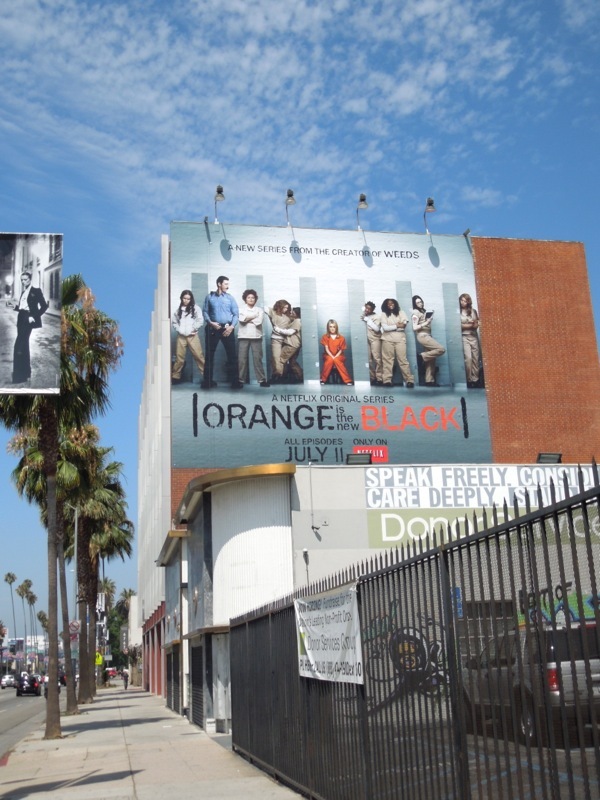 UPDATED: Here's a slightly rejigged version of this toilet stalls creative for the new Netflix show, spotted further east along Sunset Boulevard in Hollywood on July 13, 2013. 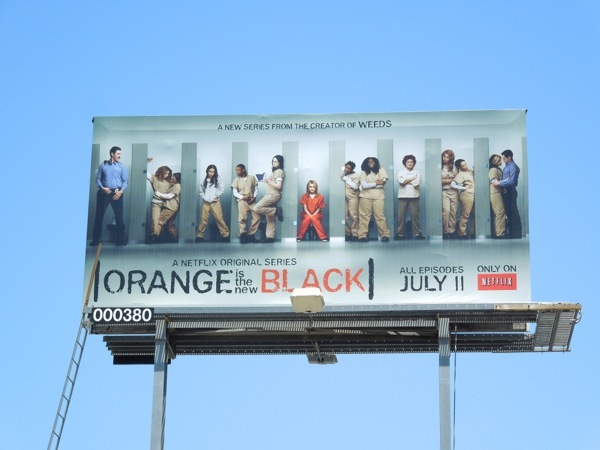 UPDATED: Orange Is the New Black was certainly a winner for Netflix, but can it win any awards for its rookie season? 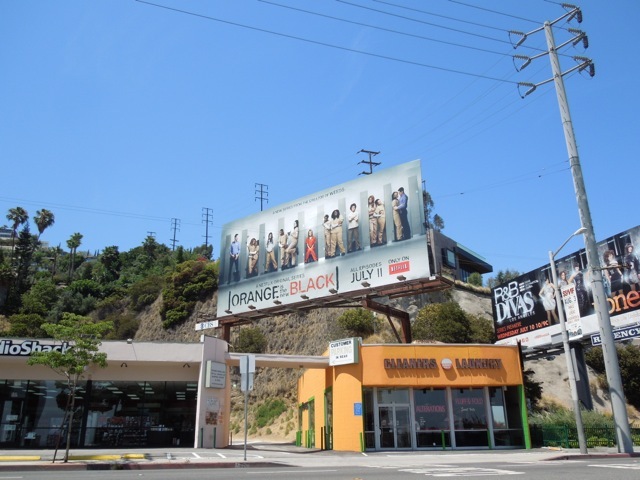 Here's an awards consideration billboard snapped along Sunset Strip on December 23, 2013 to encourage voters to decide.